I’ve always thought of myself as a healthy person, fortunate in a body compliant with my physical ideals. That same body, to whom I’ve been very kind in recent years, recently turned on me in two separate ways. While neither situation is serious or permanent, both were nevertheless a glitch in my normally steady health. First was the slightly elevated cholesterol at the end of January. I was incredulous. How does a dairy-sensitive pescetarian get high cholesterol? Despite the fact that my HDL (good) cholesterol was excellent, that darn LDL (bad) cholesterol apparently enjoyed some winter egg and cream cheese indulgence (I may have cooked one too many batches of creamy white chili). I’m now slightly haunted by what my cholesterol must have measured 10 years ago… Genetics and comfort food are powerful, my friends. My doctor (who, I must tell you, is endlessly wonderful regarding my health anxiety) says my age, low cardiac risk and good HDL actually counter the small elevation quite well, and I have no cause for alarm. Diet, exercise, a redraw in six months. Calm restored. Second, a problem that never plagued me during my server years: Sciatica. Maybe I carry Iris the wrong way. Maybe I was sitting too much. Maybe my mild stress over the manageable discomfort encouraged the aforementioned anxiety to sneak in and cause a ruckus. All I know is that I couldn’t stand on my left leg for more than a couple minutes, and the thing was going numb. In fact, everything that wasn’t a right leg or above the hips was numb. Everything. Now there’s a sensation that’ll make it tough to concentrate on your work. The same doctor put my concerns to rest, assuring me that the extent of the tingle was common. Amazingly enough, it began to subside as soon as I hung up the phone. I hope that man never retires. Good health is never guaranteed. Still, something tells me that less diet and exercise diligence might have made these issues larger and less easily addressed. Oh, and a maintained, routine relationship with the right doctor. That’s important. Let’s not take anything for granted, and keep those odds in our favor. In a fully separate arena: You may or may not know of my massive history nerdiness. 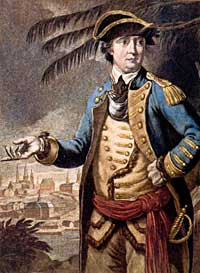 The pic of Benedict Arnold, in addition to illustrating “turncoat,” commemorates the 20th anniversary of my initial viewing of the 1984 George Washington miniseries in my 7th grade American history class. Perhaps you were in that class with me… The movie is finally available on DVD, and I can at last ditch our VCR (though maybe not the VHS copies my parents caved and made after renting the film too many weekends in a row). Welcome to the archives; all dorks need a place to flourish. We gotta have a George marathon. I want to indulge in the history geekery.